“Spare Parts” also belongs in this list. Young people of Mexican descent, most undocumented, are attending a high school in Phoenix and being assisted by passionate teachers and an enthusiastic director (Jamie Lee Curtis), despite their sometimes desperate situation, so they can obtain a proper education. Fredi Cameron (George Lopez), an engineer, is apparently desperately looking for a job and therefore applies for the vacant position as temporary science teacher. At the insistence of Oscar (Carlos Pena Vega), who due to the lack of a birth certificate can’t enlist in the US Army, Fredi accompanies a group of students to compete in a national robot competition against renowned universities such as MIT and Virginia Tech. The sad thing about such “underdog-contending-with-a-superior-group” films, is that the outcome is already known before the film started. An additional issue covered in this film is the problem of people living illegally in the USA. The constant threat of being arrested and deported, is regularly brought up. Furthermore, the known clichés aren’t eschewed either. The sympathetic teacher who acts as a father figure and apparently suffers of a trauma out of the past (although this is not really explained in detail in this film). The romance that blossoms between him and fellow teacher Marisa Tomei (Gwen Kolinsky), a single mother who also happens to know a bit of programming. The animosity between the young people that slowly turns into an intense friendship. And of course the ultimate denouement which is so obvious. Although I had to restrain myself from spontaneously bursting into an applause. But that’s usually the objective of such a movie. Certainly you can’t say this film is truly original, but the performances are admirable. The diversity of the teenagers and their array of talents ensure both funny and heartfelt moments. Maybe at times a little bit too corny. Oscar is the driven leader. Christian (David Del Rio) is the intellectual who has a proper scientific solution for every problem posed. Lorenzo (Jose Julian) is the electronics specialist and Hector (JR Villarreal) is not the brightest of them all but surely is useful when it comes to lifting things. Both the interaction between these characters and the way they build a prototype with cheap material and spare parts (even tampons solve a problem) creates humorous moments. And I thought Jamie Lee Curtis was a surprise as a supporting act. A director who uses non-conventional methods for running a school. Brilliant at times. 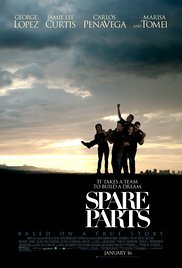 “Spare Parts” certainly isn’t a blockbuster and will appear in the VOD circuit. It’s no more than a TV movie based on a true story, as so many movies have already been broadcasted. The most captivating moment was when Jamie Lee Curtis announced the results via the intercom, and you see that nobody is really listening. A brief moment so meaningful : a school community where certain individuals do well-intentioned efforts and you realize that this school community show no interest in it at all. Fortunately, it’s not always like that ! Many movies are taken using the race cars and that are assembled cars based on the rider wish. Can not stand George Lopez.